During the pilot, two robots were able to support the warehouse’s pickers by carrying the weight and automatically dropping off orders once loaded. Collaborative robots for other services, like co-packing and mobile piece picking robots, which autonomously navigate through warehouse shelves, are also being tested. 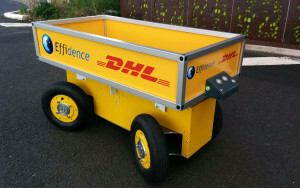 “The picking cart follows the picker through the rack system,” said Michael Artinger, site manager, DHL Supply Chain (responsible for the test). “Once it reaches full capacity, the picker simply sends it to the designated drop-off location, while another picking cart joins.